Residential Storage Containers | T.P. Trailers, Inc. Residential storage containers are water and wind resistant and are manufactured to look like sheds. They are great for storing yard tools and lawn machines. Moving? Use the residential storage containers to house your moving boxes. Contact our sales representative today to talk about buying your own residential storage container with lockable roll-doors, 1-800-255-0666. 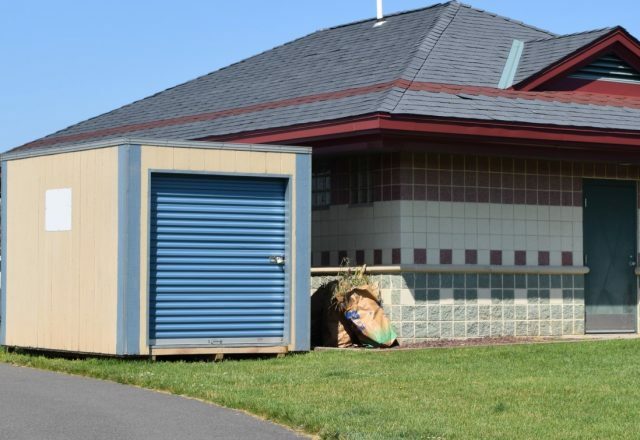 7’ x 16’ residential storage units are weather resistant and designed to look like sheds and blend into the scenery around your home and neighborhood. They are perfect for storing memorabilia, small furniture or moving boxes. These units are delivered on a roll back, they require 60’ of straight space for unloading. These units also require 13’ 6” of clearance to deliver.